Reintroduced as part of the LIFE Vultures project, the seven animals will hopefully complete the creation of a stable red deer population in the area. This population will provide an important food source for local scavengers and predators, as well as boosting biodiversity through their grazing. 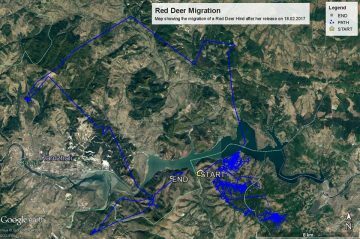 The red deer released in the Rhodope Mountains rewilding area in early February complete the creation of a herd of 50 free roaming animals. 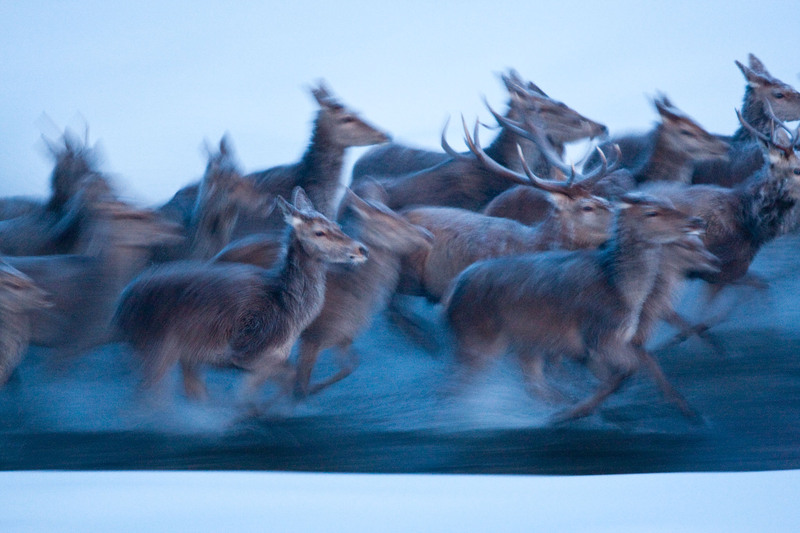 At the beginning of February seven red deer were released in the Rhodope Mountains rewilding area in Bulgaria. This release, representing the last group of animals to be reintroduced within the framework of the LIFE Vultures project entitled “Conservation of black and griffon vultures in the Rhodope mountains” and through the support of Fondation Segré, means the area is now home to a well-established population of 50 free roaming red deer. By re-establishing red and fallow deer populations in the Eastern Rhodopes the Rewilding Rhodopes team and partners are working to restore food chains by increasing the number of ungulates (hoofed animals) that form an important prey base for both carnivores and scavengers. Remains of dead deer – partly as wolf kills – are an important food source for griffon, Egyptian and black vultures. 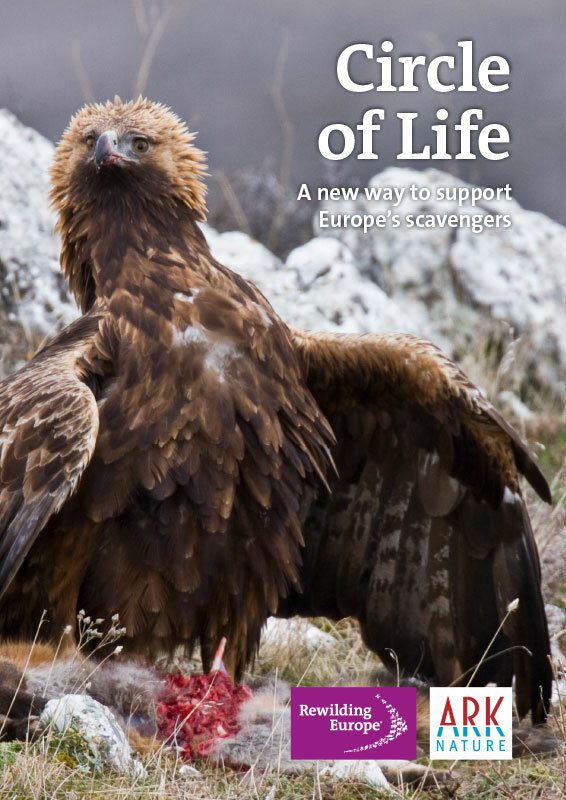 This is in line with the Circle of Life, a new approach put forward by Rewilding Europe and partners to support Europe’s scavengers. Through their grazing the deer will also increase biodiversity at a local level by helping to create mosaic landscapes. Five of the deer have been equipped with satellite transmitters. This will allow the Rewilding Rhodopes team to monitor their movement in real time and identify the threats that they face, thereby boosting protection measures. The team are already receiving valuable and interesting information from transmitters fitted to previously released deer. They were surprised to see that one hind (female red deer) regularly makes long journeys outside of the protected area, enjoying long shore-to-shore swims on the banks of the Studen Kladenets reservoir. The animal is also successfully coexisting with wolves, having spent at least a few days in close proximity to a wolf captured on a camera trap. Unlike this adventurous hind, the other red deer equipped with transmitters appear to prefer a quiet, relatively sedentary life, staying close to their established food sources. The rewilding team has also installed camera traps for better continuous observation of the animals. 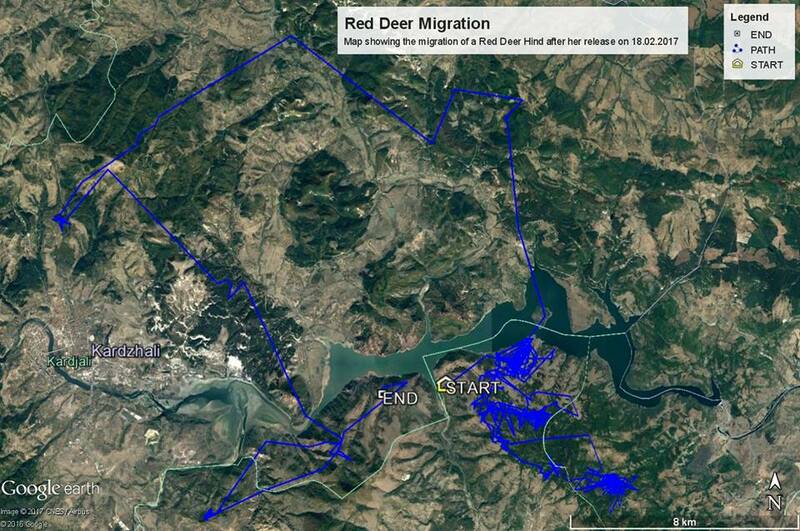 This tracking illustration depicts the 50-kilometre long journey of one highly inquisitive GPS tagged female red deer in and around the Rhodopes rewilding area. The red deer is depicted regularly on paintings inside ancient Thracian tombs in the Rhodope Mountains. But in recent times it was poached to the edge of extinction. Only a few dozen animals survived in the border areas of the Eastern and Western Rhodope Mountains, and in the Zhenda state hunting reserve.